ZWISCHEN (engl: BETWEEN ) is the name of the commissioned project that RELAX realized at the Elementary School Brünnen/City of Bern. A new building by Ernst Gerber Architekten+PlanerAG. ZWISCHEN is in three parts: it consists of cushion-like useme*s in the signal colours red, orange, yellow and silver, which are distributed on all five floors of the new school building. On the other hand, useme*s are attached to a device specially designed for them, which is located between the school area and a fenced apple tree meadow, sie sind auch im Schulgarten verstreut. 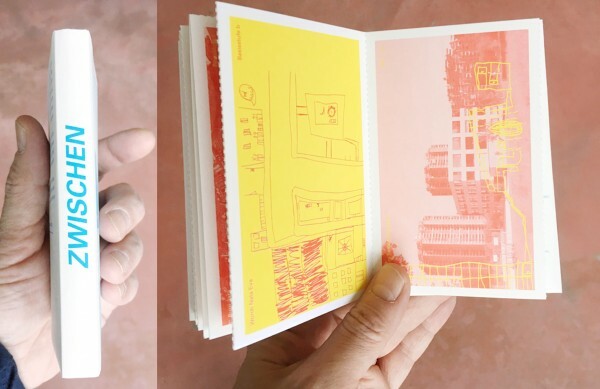 Third part is a Leporello booklet with drawings by the children attending this elementary school, in which they visualized the way from home to school, all drawing are designed as detachable postcards.